Laundry Rooms are the workhorses of the home but that doesn’t mean they can’t be beautiful as well as functional. 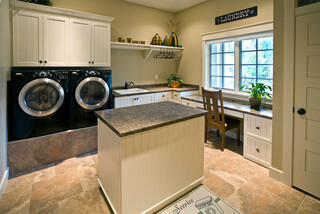 A well organized and practical laundry room can help you achieve your organization goals around the rest of the house. If you’re building a new laundry room or remodeling your current one here are some tips to help you make the most of your space. Laundry Room for the 2012 ASID Showcase Home by Twin Cities Closet Co.
Have a drip dry area: Having a drip dry area is critical if you have delicates that can’t go in the dryer. Try locating a drip dry hanging rod over a floor drain to avoid standing water on the floor. If you don’t have a floor drain locating it over a laundry sink is the next best alternative. Traditional Laundry Room by Green Bay General Contractors Gryboski Builders Inc.
Raised washer and dryer: If you have front loading machines build a platform to raise them up off the floor. This will save you back when you are transferring heavy loads of clothes from the washer to the dryer. Try to raise the washer/dryer at least 15in off the floor for optimal efficiency. Ironing Board: Having an Ironing board located in the laundry room will save time when you need to get your clothes pressed when they come out of the dryer. For those short on space, a drawer ironing board can give you the benefits of a built-in board without taking up wall or cabinet space. Hampers: Having built-in laundry hampers in cabinets can help you keep clothes organized and your space tidy. If you have the space consider multiple hampers so you can separate your clothes by colors, whites, or darks. Refrigerator: Today laundry rooms preform more duties than just washing clothes. They often double as mudrooms, pantries, and storage areas for cleaning supplies. Many people are including space for a second refrigerator to serve as overflow for the kitchen fridge. In you don’t have space to fit a full refrigerator a small under counter one can work just as well as a beverage center. As with any remodeling work, its important to consider the functions you want the room serve during the planning stages so when it comes to build you don’t go over scope and budget.